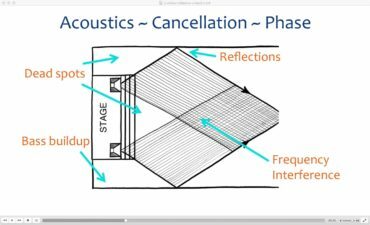 Live Sound Basics covers important fundamentals normally taught in the first year of a university program. Instant Feedback-Killer Battle Plan will get you started on the right foot with thinking about stage layout for better gain before feedback. Check out the Great Church Sound mobile app for a free soundcheck checklist. 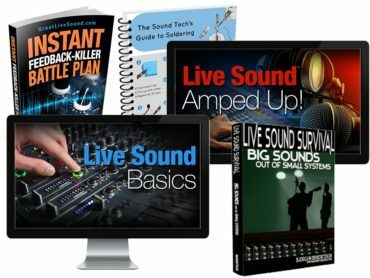 Live Sound Basics comes with three packages: Live Sound Basics, Live Sound Survival, and Soundcheck Checklist and EQ Chart. I have already reviewed Live Sound Survival in another article so I will be focusing on the remaining two packages. This is a collaboration between Björgvin Benediktsson from Audio Issues and James Wasem from Great Church Sound: a guide for the volunteer. Video one starts with a nice overview of system components and interconnections. The slides are clean and easy to read. If you are brand new to live sound, this is perfect. It covers a lot of the stuff I paid $36,000 to learn in college. Wasem suggests downloading the Great Live Sound mobile app, but all I could find was the Great Church Sound mobile app, which includes the Sound Check Checklist. I really like checklists and this one is no exception. Although I don’t see myself actually having the patience to use it on a live event, it is a good overview and could be used for planning purposes. The pace was a bit slow for me. Luckily, that was easy to fix that with the playback speed in VLC. I wouldn’t say that the cold leg of a balanced cable gets “cancelled out.” I would say that the hot and cold leg get summed while what’s common to both of them gets cancelled. I wouldn’t include an electric guitar under line level signals unless it has active pickups. Line level devices have active electronics with nominal level in the 1V range. I would consider the guitar to be in the microphone level or instrument level category. I don’t recommend being bashful with channel EQ, especially for beginners. Wasem suggests start with a small cut and sweeping the frequency to find what sounds best. I would recommend starting with a big cut or a big boost so you can really hear what you are doing, then scaling back once you have identified the frequency. Wasem suggests starting with 2:1 compression ratio for vocals and 4:1 for bass, but I would use the opposite settings. Our ears are more sensitive to level changes below 1kHz, which why I start with a lower ratio for bass guitar. Vocals are one of the most dynamic instruments, so I need the most help controlling their range. The slides are clean and easy to read and there are some nice designs showing how speakers interact with a room and each other. This video is great at raising a lot of important questions. I wish it had a part 2 to answer them. I don’t say phase button. I say polarity inversion. I don’t attribute low frequency cancellations in small rooms to a lack of space for the wave to develop. 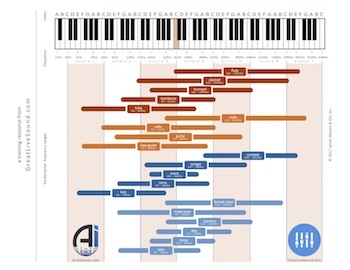 This chart is nicely laid out and what I learned from it is that the highest fundamental frequency of any instrument represented is 3kHz, which means that everything I hear above 3kHz is a harmonic. Neat! I was really excited about this one because I hate microphone feedback and Wasem kicks it off right by talking about speaker placement. When most people think of fighting feedback, they think of EQ, but you can’t solve acoustical problems with electrical solutions. Speaker placement and aim is our first line of defense. Wasem makes a very important point about training yourself to identify feedback frequencies that I only learned recently. I love the microphone 3D pickup pattern illustrations. Looking at 2D designs only gives you part of the story. I learned that you should maintain a 45º angle in the vertical plane between a super cardioid microphone like a Shure Beta 87a and the stage monitor because the mic is more sensitive in the rear than at 45º. You can see the illustrations in this article by John Mills on Pro Sound Web. I would love to see more practical examples of the theory that Wassem teaches. He obviously has a lot of experience and could share a number of stage layouts and room designs that have worked for him in the field. This is a great guide and the illustrations are helpful. If I were to change anything it would be to talk about how to know which wire connects and to make it clear in the title that this is a guide to soldering XLR connectors. This is a duplicate of the checklist offered in the Great Church Sound mobile app, but it’s nice to see it all laid out. Put guitar amps on a stand that is angled up at the guitarist. Yes!!  If I had it my way, every guitar amp would be placed at head height at a distance of no more than 2 feet from the guitarist’s ear. Instead, they often end up on the floor, blasting the front row of the audience. I almost never pin the stage before the band arrives unless they have set it up ahead of time or we are so short on time that there will be no time for sound check anyway. Everything is going to move once the band hits the stage and it’s super annoying if the stage is already cluttered with stands and cables. There’s only so much chaos one man can handle. I don’t start my sound check with the drummer. If I know the band and they are experienced playing on stage I will have them play all together, otherwise I will start with the vocals. The vocals have the greatest needs from us in terms of amplification and special treatment and they are also the main instrument whose quality the audience will notice. In small rooms, you may discover that the maximum GBF of the vocals is so low that amplifying anything else is unnecessary, saving yourself a lot of time.